The Latin American hedge fund space has seen exponential growth over the past decade, with the number of funds and assets therein having recorded an almost four-fold and a remarkable 23-fold increase respectively, between end-2000 and end-2007. The Eurekahedge Latin American Hedge Fund Index recorded impressive returns of 20.6% (annualised) during the period. However, the industry shrank over 25% in terms of assets during 2008, against the backdrop of slowing global economic growth, weakening credit markets, diminishing risk appetites and record-high redemptions out of hedge funds (US$12 billion from Latin America and US$219 billion globally). Based on the data on over 450 funds (including 93 obsolete and 43 long-only absolute return funds) in the Eurekahedge Latin American Hedge Fund Database there are 377 hedge funds with US$39 billion in assets, currently investing in the region. 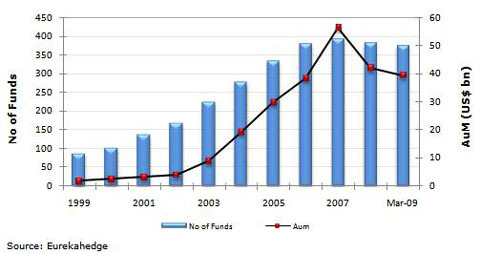 Despite shrinkage of the industry in 2008 and 1Q2009, the data points towards an over 3.5x increase in the number of funds since 2000, and a marked 16-fold increase in assets over the period. The figure below shows the growth in the number of funds and assets in the Latin American hedge fund industry over the past decade. To read the full report, please click here to download the Eurekahedge Report.